A psychic leaves her a present—but is it a blessing or a curse? 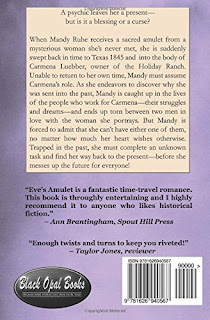 When Mandy Ruhe receives a sacred amulet from a mysterious woman she’s never met, she is suddenly swept back in time to Texas 1845 and wakes up in the body of Carmena Luebber, owner of the Holiday Ranch. Until she can return to her own time, Mandy must assume Carmena’s role. As she endeavors to discover why she was sent into the past, Mandy is caught up in the lives of the people who work for Carmena—their struggles, hopes, and dreams—and ends up torn between the two men in love with the woman she portrays. But Mandy is forced to admit that she can’t have either one of them, no matter how much her heart wishes otherwise. Trapped in the past, she must complete an unknown task and return to the present—before she screws up the future. First, I must say that I’m not a big fan of romance. The story has to interest me, first and foremost. Once I begin reading it has to hold my interest, or I just skip the end just to see how it finishes. Such was not the case with Eve’s Amulet. Carole Avila knows how to weave a story. She also knows how to do research and it all shows in the pages of this book. The story overflows with historical details that set the time and place. This is a fascinating read complete with romance, time travel, and historical fiction. The pages turned quickly in this one for me and I think everyone that reads it will also find it an enjoyable, quick read. 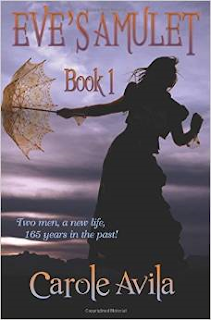 Two men, a new life and a trip 165 years in the past. Looking for a good read? Like romances with a twist? How about a time travel romance with historical accuracy that takes place in 1845 Texas? May I recommend Eve’s Amulet Book 1? 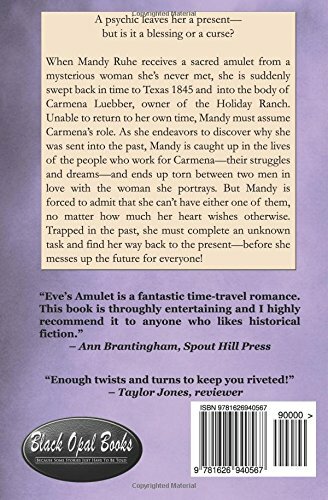 Overall, Eve’s Amulet Book 1 is a satisfying read, it is able to hold the reader’s interest while taking one through twists and turns until it gets to the finish and then, it leaves an opening that leads to book 2. I don’t know about you, but I’m anxiously waiting for that next book. "When I was 3 years old I knew after reading Go, dog. Go! that I would become a writer. My writing sometimes reflects facets of myself or people I know, both good and not so good. It's great to be able to use the written word as a form of creative self-expression. I don't want to limit myself to one genre, and many of my books that are yet to be published are cross-genre." Carole Avila has won awards for her short stories, memoirs, and poetry, and has had a play produced. In addition to her love of writing, Carole is a fan of reading, playing scrabble, drawing, painting, and walking on natural trails. 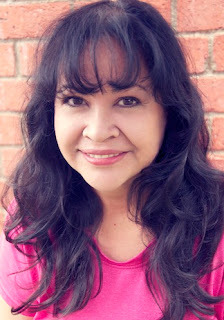 She loves spending time with her children, grandsons, and her two loyal dogs. Carole says, "There's nothing better than a 5-star book and a hot chai latte." Don't you agree? I sure do.